Mini Skip Hire Mount Gravatt - Speak to a person now! Plenty of homes in Mount Gravatt have expansive, beautiful gardens, but it can be difficult to make yours stand out above the rest without landscaping it from time to time. Australia experiences harsh weather conditions frequently, meaning everything you keep outdoors should exhibit robust resistance to the elements. Over time, wooden fences can fade and rot, metal gates can start to rust and degrade, and your flower beds can become riddled with pests and weeds. If you think your landscaping efforts will produce a significant volume of waste, you might need to consider mini skip hire Mount Gravatt. You’d be surprised by how much bin space the junk from your yard requires, and if you’re landscaping your entire garden, you’ll need something bigger than your wheelie bin to hold all the waste. However, you probably won’t require a large skip bin for garden waste regardless of the scale of your revamp. If your wheelie bin is too small and a large skip is unnecessarily large, you ought to consider Mini Skip Hire Mount Gravatt. At Lightning Skips, we have a broad range of skip bins in various sizes to make all waste disposal tasks simple, and we’ll deliver a mini skip to your address the very same day if your order before noon. If we can’t reach you the day you order, we will deliver your mini skip in less than 24 hours. Plus, we’ll retrieve the skip when you’re ready and dispose of your junk responsibly so that you can concentrate on landscaping. Keep reading below to learn about the main benefits of mini skip hire. There’s no reason to hold off landscaping through fear of the resulting waste when we can dispose of your junk quickly for you. Here’s why hiring a mini skip Mount Gravatt is a good idea. Don’t dirty your car – Some people may be tempted to transport their garden waste to the landfill using their vehicle to save cash, but garden waste can make cars smell, and the dirt can be hard to eliminate. Plus, if you hire a skip bin for an affordable price, you won’t have to make several potentially expensive trips to the dump site. Let the professionals dispose of your waste responsibly – We all need to do our best to take care of the environment, which is why we endeavour to recycle as much of your waste as possible. Concentrate on landscaping – It might take a long time to landscape your garden, so you may as well let our professionals take care of waste disposal. We’ll dispose of all your junk so you can focus your efforts on landscaping. 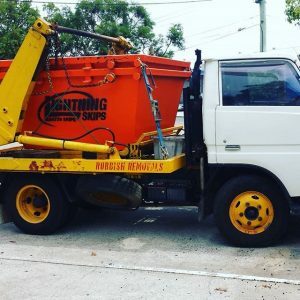 At Lightning Skips, we’re quickly building a reputation for ourselves thanks to our excellent customer service and prompt skip bin delivery and retrieval, and we’re here to make your landscaping efforts easier by disposing of waste for you. If you need a mini skip to revamp your garden as quickly as possible, contact us today using 0472 975 477 to find out how we can help, or go to our homepage to get a quick quote using our booking form.